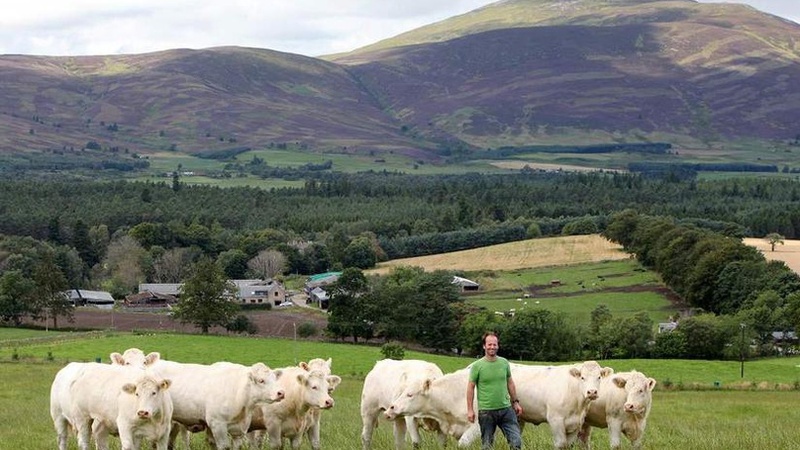 CKD Galbraith has been instructed to sell the famous Blelack pedigree livestock enterprise which is situated in a picturesque location on Royal Deeside near the town of Aboyne in Aberdeenshire. Royal Deeside is renowned as an area of outstanding natural beauty, offering easy access to the hills, woodlands, lochs and rivers and is an eastern gateway to the Cairngorm National Park. Simon Brown, handling the sale for CKD Galbraith said: "We have been instructed to sell Blelack farm along with the famous herds of Aberdeen Angus, Charolais and Shorthorn cattle in conjunction with United Auctions. Blelack is situated in one of the most beautiful and unspoilt areas of Scotland and the farm has been producing top class pedigree cattle for over 45 years"
The land at Blelack sits between 750 and 1000 feet above sea level and is principally categorised as being Grade 3(2) by the James Hutton Institute. The farmland provides an excellent mix of good quality arable and grazing ground with an additional area of well sheltered free draining permanent pasture which is suitable for outwintering cattle. The farmland extends to approximately 449.87 acres (182 Hectares) and is accessed by a network of farm tracks and a minor public road. The sale also includes an attractive five bedroom farmhouse, Rose Cottage which is situated in a private and scenic position to the north of the farm steading. There are a further 3 three bedroom cottages and a one bedroom flat at Blelack Farm as well as an extensive range of modern and traditional farm buildings which provide housing for over 400 head of cattle. David Leggat, United Auctions' Executive Chairman, said: "The sale of Blelack and the herds of Aberdeen Angus, Charolais and Shorthorn cattle together with the world renowned Blelack' herd prefix presents a unique opportunity for anyone wishing to enter the pedigree cattle breeding business at the highest level as the herds have a consistent record of producing top grade bulls and females. Blelack has achieved the highest number of Aberdeen Angus champions and reserve champions at Perth and subsequently the Stirling Bull Sales with a total of 12 in all." "Subsequent to the foundation of the Angus herd, the Charolais herd was founded in 1970 and has also enjoyed great success with a number of championships to its credit at both Perth and Stirling Bull Sales. The herd has been a ready source of pedigree and good commercial stock bulls with bloodlines from Blelack to be found in most of the leading herds in the UK."